Summer in Melbourne may be ending soon, but you still have time to catch the final days of sunny, warm weather before autumn comes upon us! Summer is the perfect time to dress down with casual looks that are both laid back and stylish. Chinos, short sleeves, and linen are back, and it’s perhaps the only season wherein it’s acceptable to complete your look with your favourite flip-flops and sandals. Sandals are great summer shoes. They can be cool, chic and elegant. Here are some open-toed options whether you’re chilling poolside, going to a BBQ, or heading out to a casual night out. These chunky, cork-soled sandals popularised in the 1960’s have made a surprising comeback in recent years. Choose a pair in traditional brown or navy (or white if you’re feeling bold), and wear it with a pair of tapered navy wool tracksuit bottoms, a tonal knitted polo shirt and a light jacket in a similar shade. It’s a smart, trendy look for a summer evening. As its name suggests, poolsides are ideal for days spent lounging by the pool. Wear them with some understated swimming shorts for a functional and cool look. A great way to get into the sandal trend is with some chic, high quality leather sandals. Opt for a pair with a thin leather sole, and thick enough straps that they still look manly. Wear them with slim cropped chinos in a dark neutral colour and a light coloured open neck shirt for a relaxed yet fashion-forward look. What are fashion sandals? Think chunky soles, bright flashes of colour, luxurious exotic skins, and oversized straps made by designers such as Marni, Lanvin or Givenchy. 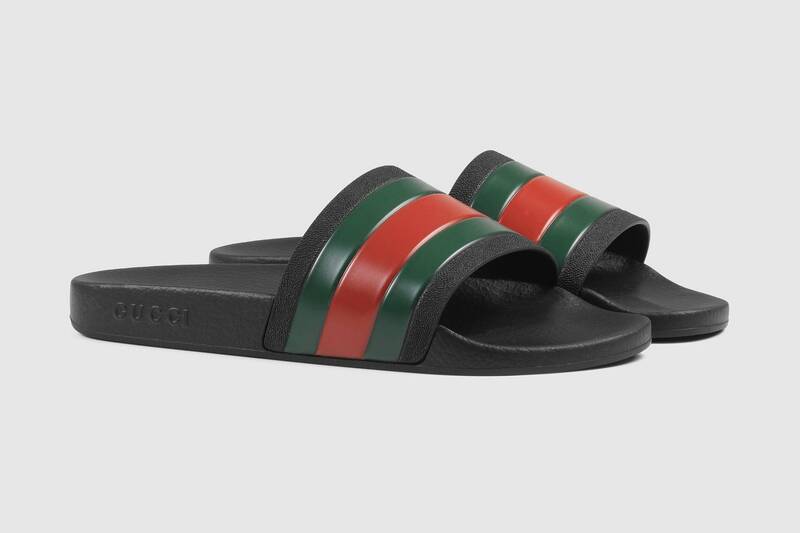 Fashion sandals take inspiration from Birkenstocks but are made more trendy and high-end with a multi-layered sole, fine metal detailing and a sneaker-like aesthetic. Wear them with a pair of tailored shorts and a t-shirt and you have a look that’s perfect for a weekend at the beach. Flip-flops are acceptable summer wear but veer away from your standard tire-rubber thongs and instead opt for more trendy heel strap flip-flops. A word of advice though: flip-flops should only ever be worn at the beach, by the pool or in the garden. Wear them anywhere else and you’re committing a serious fashion felony. Wearing summer sandals in stylish ways can be a challenge even for the most fashion-forward gentlemen. But if you know the right pieces to wear sandals with (such as tailored shorts, chinos, light shirts) and only wearing them to appropriate places, then you’re on your way to rocking summer sandals in style.